In 2017 I published a post Dates as operations 2017 - a collaborative effort to write a mathematical statement from the digits of the date. Here is the 2018 version. To quickly access in class type gomaths.net/dates into your address bar. My Year 7s do not have a good grounding in division. I put up my first image on Dan Meyer’s 101 Questions yesterday, Kitchen Scale. Wander over there. What’s the first question that comes to your mind? Whilst often used as a textbook example, I had never seen negative numbers used in a lift before. In 2007, I wrote about a resource, a Number Spider, that I used as a lesson starter. What if the largest states of Australia had the biggest populations? 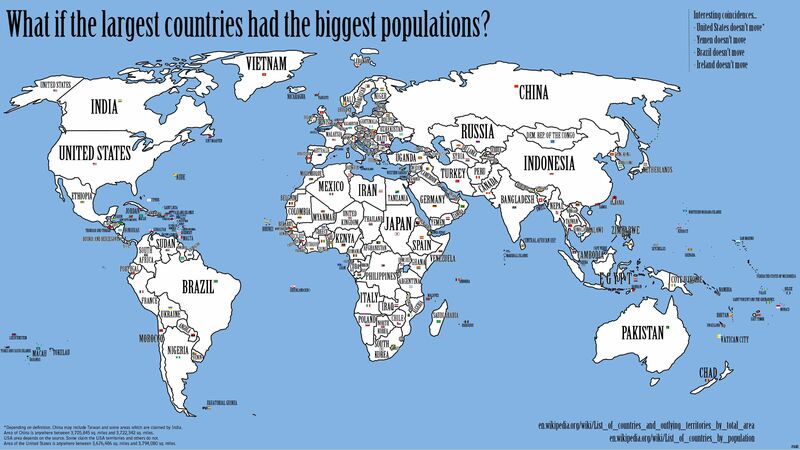 So I wondered, what if the largest countries had the biggest populations? A real-life version of this problem presented itself today. Jeff of Webmaths points out a new Australian TV show, Letters and Numbers. This week, my Year 8s have been looking at inequality signs, graphing inequalities and solving simple (one-step) inequalities. Today, after solving inequalities, we played a simple game. A simple, obvious game, that really doesn’t warrant a blog post. I’ve been meaning to try ClassTools.net for a while. With ClassTools.net you can make interactive Flash games, from a range of templates, then save and share them. I used to think that I knew what 1 billion was, i.e. 1 000 000 000 000. Then a couple of years ago, I looked on Wikipedia and found there were two defintions: Long and short scales.